The cuisine of Southeast Louisiana is informed by a unique landscape. Defined by water--Vermillion Bay to the west, marshlands to the east, the Mississippi River to the north and the Gulf Coast to the south--the scenery transitions from verdant swamps to open seas stocked with diverse wildlife. The indigenous Cajun cuisine is a cultural blend three centuries in the making, with traces of American Indian, French, German, Italian and African heritage. To feed themselves and bourgeoning markets, locals built formidable aquaculture empires. Eventually, the area became less isolated, offering more opportunity while threatening traditions. 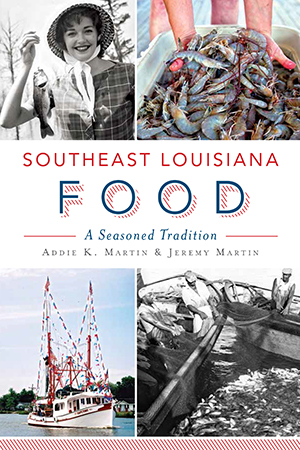 With interviews and family recipes, authors Addie K. and Jeremy Martin present the history behind this enchanting culinary tradition. Addie K. Martin is a writer and blogger whose work focuses on food and culture writing. Using what she learned earning her bachelor's degree in culinary arts, she publishes Culicurious, and in partnership with husband Jeremy, they publish Culture Curious, an experiential travel blog. Addie enjoys reading, cooking, researching and writing about her experiences in food, life and travel. Jeremy Martin is an engineer and writer living a double life in New Orleans. By day the left side of Jeremy's brain is absorbed in calculations and constructions, but by night the right side of his brain comes to life, exploring history, culture, travel, literature and poetry in his writing. He runs the travel website Culture Curious with his wife, Addie, and maintains his own blog at the Restless Lens.